I want to share with you an idea for a new tool I've had during my work for Transpond. In a nutshell, Transpond is building web-based tool for making Facebook applications. Sound exciting? Have you developed anything for Facebook before? A Facebook application is a piece of code living on your own server but heavily talking to Facebook APIs. And Facebook is unfortunately something you cannot take home and run it on your own local server for debugging purposes. You need to develop and debug your application against the live site (or the sandbox they provide). And here is the problem. There is a class of bugs caused by Facebook (i.e. they break something during updates) and a class caused by specific data (e.g. encoding problems because a user entered text with diacritics). These bugs are tricky to reproduce. The first type is reported by QA but gets fixed before the developer sees it. The second type is hard because the developer may be not able to reproduce exactly the same state (for example a newsfeed causing the bug is already replaced with newer content which is not exposing the bug, or the developer is logged in under different account than QA tester). Tester installs browser extension "Rebug"
Developer installs browser extension "Rebug"
What real-world problem does it solve? QA people will get a no-brainer tool to store "crash dump" of their browser session after the fact. Programmers will get an easy tool to restore a broken session in their development environment (Firefox+Firebug in the first phase). During tester's session the proxy server is recording all HTTP traffic. 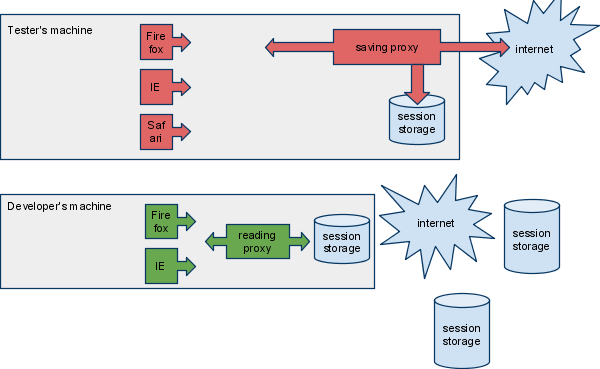 When the Rebug button is clicked, a new record is created by "zipping" all traffic data into one package and giving it a unique session ID. During developer's session every request is served back from zip file (effectively mocking "internet" at the time the session was recorded). During tester's session macro recorder is recording all the user's actions and generating reproducible script. During developer's session recorded script is played back. The technology of macro recorders was already developed by extensions like iMacros or Selenium. I've also made one attempt for XRefresh extension in the past (a very challenging problem). session storage as git repo? External browser inputs should be simulated as closely as possible (browser version, platform, date/time, screen size?, etc.) and the developer should be unobtrusively notified about differences between his setup and the user's setup - but it is not expected the developer will have exactly the same setup as testing user (for example developer has the Firebug extension which may not be the case of tester). REBUG can be used as a mockup server for automated testing infrastructure. 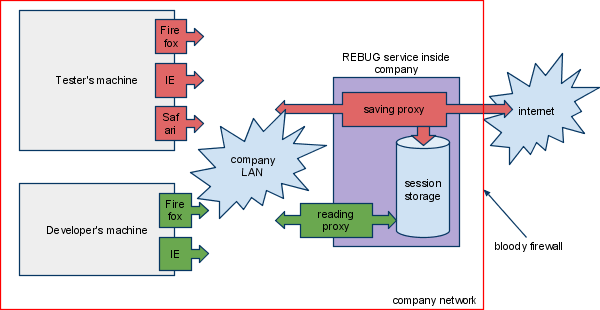 Browser sessions can be generated synthetically and consumed by defined test suites. Recording and hand-making approaches can be mixed. Thanks to storage being a git repo, it can be edited independently on the saving proxy. 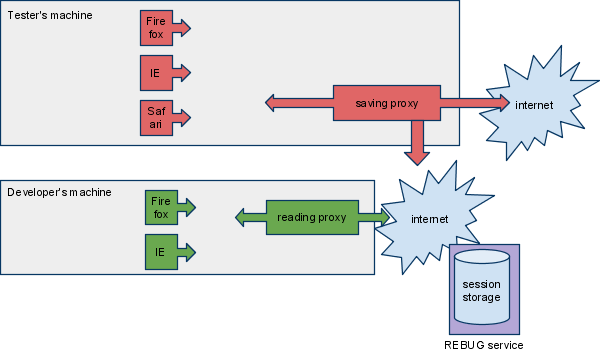 Reading proxy then can be used by automated tests runner. Note: Recent HTTP Archive initiative is a move in a good direction. Look forward to seeing more tools tackling this problem.